Scarlett Johansson is apparently well-equipped to play Dolly Parton in a movie. Since the country music singer is a legend in the industry, it’s was really only a matter of time before someone decided to tell her life story on the big screen. In addition to a feature film, Parton is also reportedly working on a musical. However, it’s unclear who will end up playing Dolly when the cameras finally start to roll. The first poster for Scarlett’s upcoming movie Lucy is now out as well as the release date being moved up from August to July 25 for the USA. No date yet for the rest of the world. A new trailer for scarlett’s upcoming movie Lucy, has just been post online. There are a lot of new clips you can see in this one. I just made some hight-res trailer screen caps of all her parts. The movie will opens in theater’s some time in August. Enjoy! Scarlett Johansson might be expecting her first child, but Black Widow won’t be showing any signs of pregnancy. The gorgeous star is said due to give birth to her and Roman Dauriac’s baby in August, which threw up a few issues for the filming of Avengers: Winter Soldier. However, The Sun reports that Scarlett will be able to perform as she is, with her growing baby bump being edited out in post-production. According to the newspaper, the actress will be wearing a high-tech suit with a green band around her waist which will allow the special effects team to remove any signs of her pregnancy. Meanwhile, it is said that director Joss Whedon has no intention of letting her off easily, still expecting her to be part of the movie’s fight scenes. Marvel Studios President of Production Kevin Feige seemingly confirmed Scarlett’s maternity in an interview about the film last month and suggesting everything will still go to plan. Speaking about the mum-to-be last month, he said: “Well my first reaction was I was very happy for her and very excited for her. 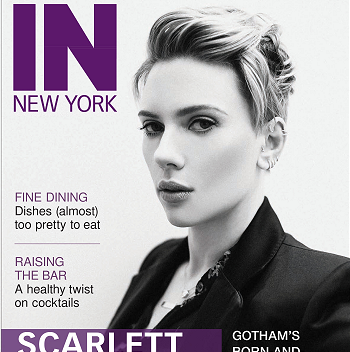 Access Hollywood just post the first look at Scarlett’s new movie Chef trailer. The full trailer will be out tomorrow so look back for that. The first Trailer for Luc Besson upcoming Lucy, starring Scarlett as Lucy opposite Morgan Freeman, Analeigh Tipton and Min-sik Choi has just come online. The movie it’s still looks great and Scarlett looks on top of her game from what we could all see. I just made some hight-res trailer screen caps of all her parts. The movie opens in theater’s some time in August. Enjoy! While “Under the Skin” is definitely worth checking out, it may be a little hard to find. So most of us will watch Scarlett take her third turn as super-agent Natasha Romanoff in “Captain America,” where — alongside Cap (Chris Evans), the Falcon (Anthony Mackie), and Nick Fury (Samuel L. Jackson) — she hunts down a lethal assassin and uncovers a conspiracy to bring down the intelligence agency S.H.I.E.L.D. The movie reunites Scarlett with Robert Redford, who plays the head of S.H.I.E.L.D. and who directed and starred with the then-12-year-old actress in “The Horse Whisperer.” We sat down with the lovely Ms. Johansson (who is currently expecting her first child) to talk about that, what happens to the Widow in the next “Avengers” movie, and what Natasha does on her days off. Moviefone: It’s great to see watch Black Widow evolve over the course of three movies. Did you know what was planned from the start? Scarlett Johansson: I mean, that was the intention, of course, when I signed up for “Iron Man 2.” The hope was that the audience would respond to my version of the Widow Natasha and want to see more. Because, I mean, I had a wonderful time doing it but you just sort of got to be introduced to the character. And I think the idea of revealing her true identity at the end was in the hopes that people would want to kind of take that and run with it. Of course, I had a really fun, playful sequence in the end there. I’ve added some new HQ stills from Scarlett’s movie Captain America 2 The Winter Soldier, enjoy! Scarlett and Samuel were on the tv talk show/game show Saturday Night Takeaway on saturday in the UK on ITV. In the part “Little Ant & Dec” for a Super Hero Party. Both Scarlett and Samuel were very funney and took what was going on well. Screen caps and the video are now up for you all to see. Here are some interviews with Scarlett for the press tour for “Captain America: The Winter Soldier” so far.